In the property page "setting" we have to indicate to Caronte Antispam the score that the messages must reach to become spam. This score is indicative, as goal to reach. Inside Caronte Antispam there are mechanisms that doesn't take care of this score, as the antivirus plugin, the Helo forged and the DNSBL max hit, which ,if configured, can "reject" the message immediately, without wait the final outcome of all of the antispam controls with the relative scores. 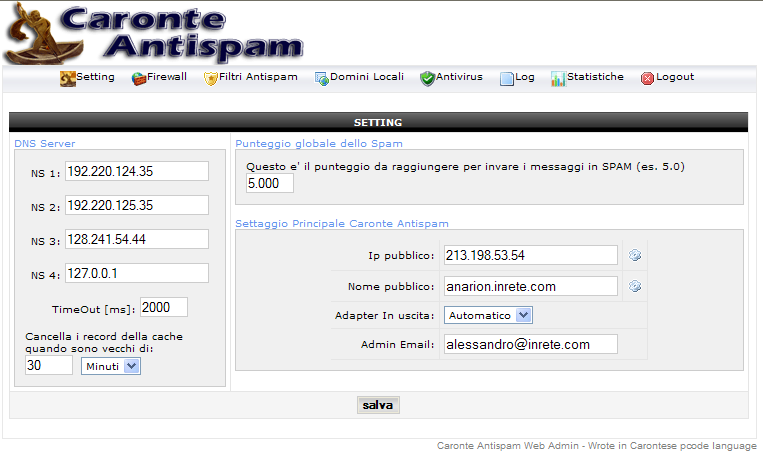 In "Caronte Antispam" are avaible four NameServers customizable. We have preferd a "manual" and not an automatic detection. This for sensitize the system administrator, see the huge stress that the application make on the nameservers, for download the necessary informations, we suggest so of fill all the 4 NS, with IP of your Nameserver or with IP NS that you can access to. The algorithm inside "Caronte Antispam" have the capacity of choose the more efficiency NS in the moment using parameters of regulation as the "timeout"
It's planned also a function CACHE where it's possible regulate the time of stay of the taked results from such interrogations. Occur to insert the pubblic ip which this server is saw from internet and a valid email. The operation of registration is only for internal use of Caronte Antispam and it's used for disciple all the future operations, as the RFC answer ,FORGED HELO and the close of services. (no datas are transmitted on internet of archieved in remote databases). Start project 10-10-2003 - Copyright © 2000-2015 C&G Servizi Web s.rl. All rights reserved. VAT N. : 01404430470 .